Our towel collection is very mixed; not many of them match, they’re all sizes, colours and thicknesses and the girls always argue over who gets the biggest one! 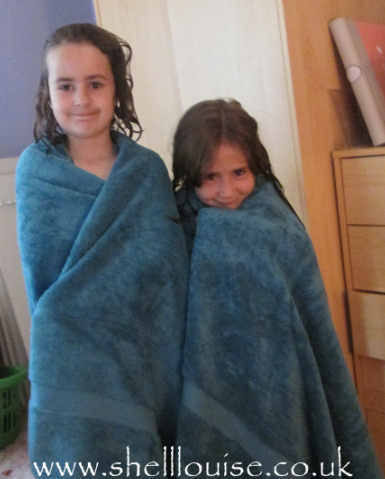 Their favourite towel is a huge bath sheet I bought a few years ago for Ant from Ebay. It’s massive, much bigger than a regular bath sheet and is big enough to hide both of the girls at once! However, there’s only one so as I said, arguments ensue. When John Lewis got in touch and asked me to review a pair of Egyptian cotton bath sheets I thought this was the answer to the bath time arguments! I expected them to be good quality because they’re from John Lewis but even I was surprised at how soft and fluffy they are. They’re big enough for the girls to snuggle up in after their bath and they’re very absorbent. Ella didn’t even bother to remove the tag before she used hers! 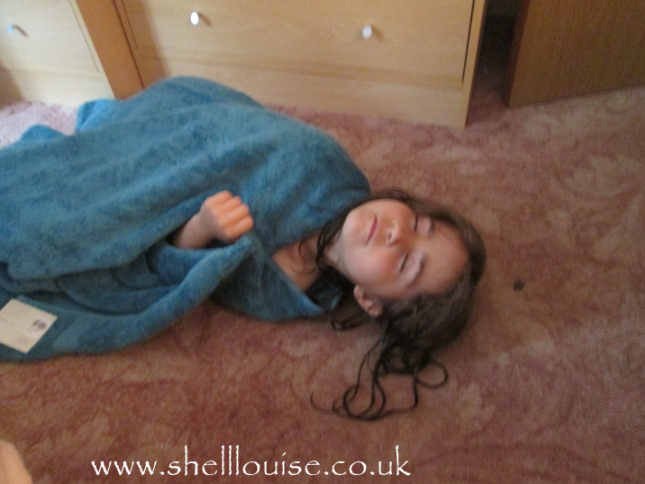 She said it was soft and warm enough to go to sleep in and wanted me to take a photo of her ‘sleeping’ in her new towel on the floor! I think the only thing that would have made happier would have been if I’d have ordered pink ones instead of Kingfisher! I gave the girls one each but I’m not sure if they’ll manage to hang on to them because Ant, Aiden and I all love them as well and keep pinching them so I’m guessing the bath time arguments may still continue! Please note: We were sent the towels to review but this didn’t secure a favourable review. This is my honest and accurate opinion. They look really good, I love Egyptian cotton stuff. I've never bought them from John Lewis yet but that colour is really lovely!